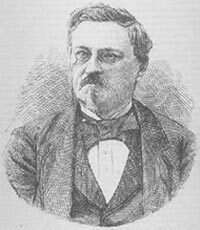 Gustave de Molinari (3 March 1819 – 28 January 1912) was a political economist and classical liberal theorist born in Belgium associated with French laissez-faire economists such as Frédéric Bastiat and Hippolyte Castille. Living in Paris, in the 1840s, he took part in the Ligue pour la Liberté des Échanges (Free Trade League), animated by Frédéric Bastiat. On his death bed in 1850, Bastiat described Molinari as the continuator of his works.